The inflatable bounce house business has seen a rise in customers over the past few years. Done rite Party Rentals is a family owned and operated company that offers party inflatable equipment to the residents of Oldsmar, Florida in Pinellas County. Oldsmar has a long and interesting history and our bounce house enterprise is honored to add a bit of modern history. Of late, bounce house parties have become the way to go in entertainment, whether it’s a birthday, picnic, church event, carnival or fair. In the year 1916, Ransom Eli Olds (inventor of the Oldsmobile automobile) purchased the land (now known as Oldsmar) on the Northern tip of Tampa Bay and embarked on a journey to turn the still untamed land into a working community. Had our company (Done Rite Party Rentals) existed back then, Ransom probably would have welcomed us into the fold. He coined the phrase “Oldsmar for Health, Wealth and Happiness.” Done Rite Party Rentals offers all three…”health” is improved with activities such as jumping and bouncing. A “wealth” of fun is gained when our bounce inflatable houses are put to use and (Happiness) is the end result. 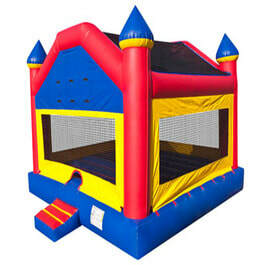 We offer a bevy of bounce house styles and sizes. 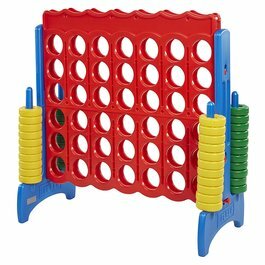 Inquire about our selection of party games. 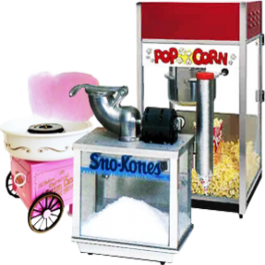 Refreshments include snow cones, popcorn and cotton candy. 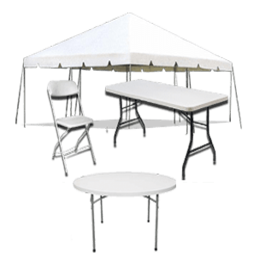 Our rental tables and chairs are available in varied sizes. Inclement weather sometimes calls for the use of a tent. ​We deliver, set up and take down all party inflatables for every special event and make sure that each bounce house and water chute is firmly secured. Our inflatable rentals can be located in backyards, parks, playgrounds and any space that fills the bill. Our bounce castles, moonwalks and party water slides aren’t just for birthdays. 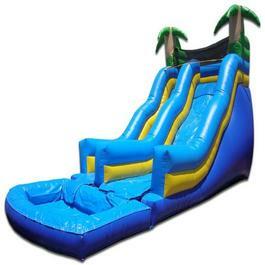 Any festivity can be enhanced by renting our inflatable rides. Oldsmar small fry light up with enthusiasm at the thought of inviting their friends to a bounce house birthday party. Grownups secretly love the idea of being a “kid” again, (if only for a little while) when they jump on one of our water slides and plummet down to the bottom. Done Rite Party Rentals likes to make people’s lives more enjoyable and therefore, we offer quality service and rental inflatables for every event in Oldsmar, Florida. Our bounce house and inflatable rentals are inspected, cleaned and sanitized prior to and after each celebration in the town of Oldsmar. We guarantee peace of mind for our party rental patrons by planning our arrivals to be in place well before party guests arrive for the festive event. Our set up techs are careful to take inventory of bounce rides, games and party extras on the “to go” list before departure to a designated party location. It’s the right step to take in order to fulfill a customer’s wishes and avoid unnecessary mistakes. Done Rite Party Rentals complies with all city codes in Oldsmar and we are insured and licensed.